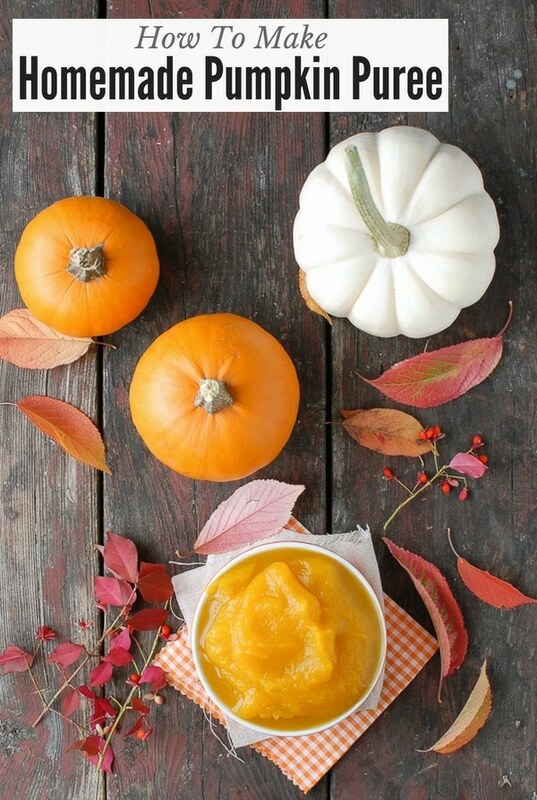 DIY Homemade Pumpkin Puree - An Easy Fall Recipe! Pumpkin Puree is a star ingredient in the fall and winter. Now you can make it yourself with this easy guide covering everything you need to know! Fall and winter are a perfect time of year for making homemade Pumpkin Puree with the abundance of winter squash available. 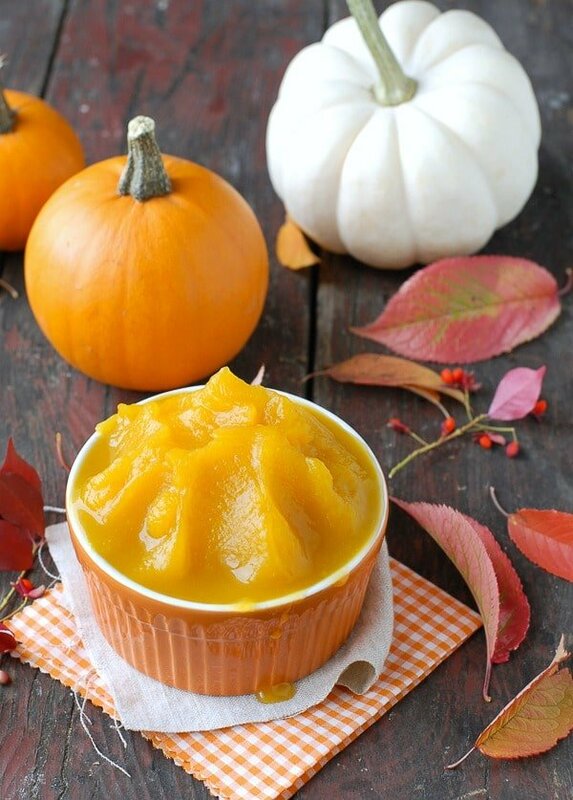 The method is simple and easy, as well as the pumpkin puree freezes wonderfully for later use. Right now in the Boulder Locavore kitchen, a day does not pass without a dish including pumpkin being happily gobbled up. 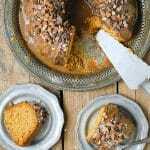 From Pumpkin Iced Lattes to Pumpkin Spice Buttermilk Bundt cake (with Salted Dark Caramel Glaze) and Black Bean Pumpkin Tamale Pie, we are eating our fill of this wonderful seasonal squash. The common theme? All these recipes require pumpkin puree. Pumpkin puree is the pureed flesh of a pumpkin. It’s the type of pumpkin purchased in cans that becomes a key seasonal ingredient in many dishes. It is the star ingredient in pumpkin pie filling, though is NOT the same as the ‘pumpkin pie filling’ also sold in cans (that has been sweetened with spices added). Pumpkin is an extremely versatile squash. It adds a creamy texture to soups, is wonderful in breads without lending an overpowering flavor, and of course stars in many desserts at this time of year. Pumpkins are an anti-oxidant, anti-inflammatory food making them a great addition to one’s diet to keep a body healthy. They also have a high amount of Vitamin C. The seeds are high in protein and I have the best method to roast them to avoid wrestling with the pumpkin goop. 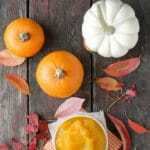 For more health benefits of pumpkin puree I enjoyed this article. What Type of Pumpkins Are Used for Pumpkin Puree? I use Sugar Pumpkins or Pie Pumpkins. They are a smaller variety pumpkin with sweeter flesh. Though small, sugar pumpkins yield a large amount of pumpkin puree. How Much Puree Does One Pumpkin Yield? The yield is highly dependent on the pumpkin’s size and its meatiness. As a guide, I recently made puree using a seven-inch diameter pumpkin whose flesh walls were about 3/4-inch thick which yielded 3 cups. The pumpkin shown in the process photos was in a 15-inch by 10-inch baking pan and had a yield of 4+ cups of pumpkin ‘meat’ before pureeing. As a rule of thumb one 3-pound pumpkin should yield the same volume as one can of pumpkin puree. Slice a sugar pumpkin or pie pumpkin in half (I suggest using a long sturdy serrated knife) (photo 1). Scoop out the seeds and membrane (use a large kitchen spoon OR a pumpkin scooper for this task); (photo 2). Reserve the seeds for making Roasted Pumpkin Seeds. NOTE: don’t worry about removing all the membrane. After the pumpkin is cooked it’s very easy to remove before scooping out the flesh to puree. Place the pumpkin halves cut side down in a large baking dish filled with 1-inch of water (photo 3). Bake the pumpkin halves for 45-90 minutes (photo 4) depending on the size of the pumpkin (a 3-pound pumpkin will cook for about 45 minutes, a 4-pound pumpkin 60-70 minutes). 7. When the pumpkin is done (the flesh will be soft and easily separated from the skin), remove from the oven and allow to cool until it can be handled comfortably. 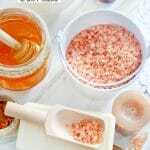 Scoop out the flesh and process into a puree in a food processor or blender. 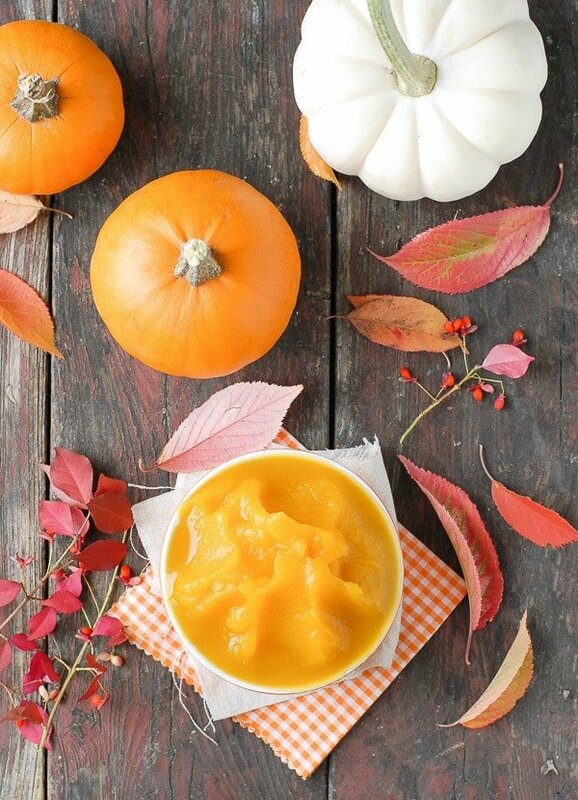 How Long Does Homemade Pumpkin Puree Last in the Refrigerator? Kept sealed, homemade pumpkin puree will last 5-7 days in the refrigerator. Pumpkin puree freezes wonderfully so it can be kept for future recipes or to use in the off season if you prefer that to buying canned pumpkin. Freezing Tip: pour the puree into an ice cube tray, freeze fully then transfer the frozen puree cubes to a larger freezer container or bag. 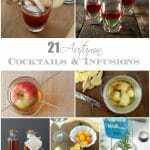 It is a very easy way to use small amounts and to get ahead on your Thanksgiving ingredients! When frozen in an airtight container, the puree will last 6-8 months. Slow Cooker Spicy Pumpkin Chicken Corn Chowder is a favorite hearty comfort recipe for the colder months. Who doesn’t love a Perfect Pumpkin Bar using your own homemade pumpkin puree? No one, that’s who. 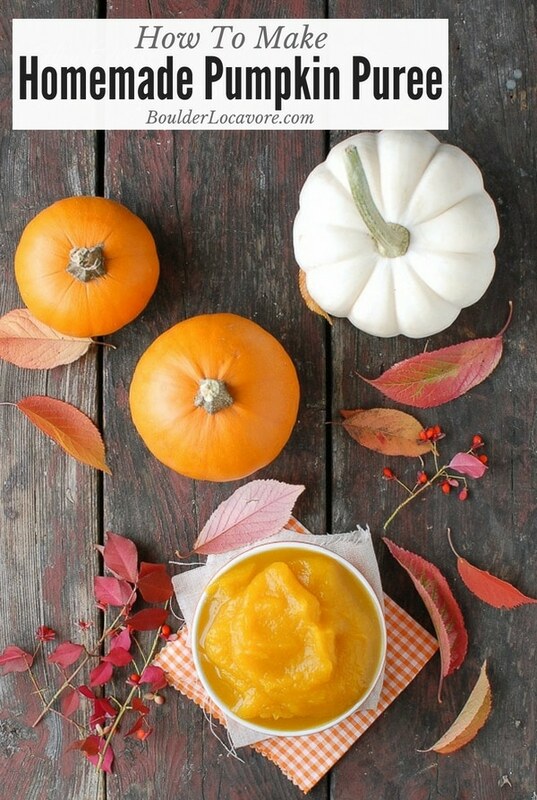 If you’ve tried this Homemade Pumpkin Puree recipe please RATE THE RECIPE below! Fall and winter are a perfect time of year for making homemade Pumpkin Puree with the abundance of winter squash available. 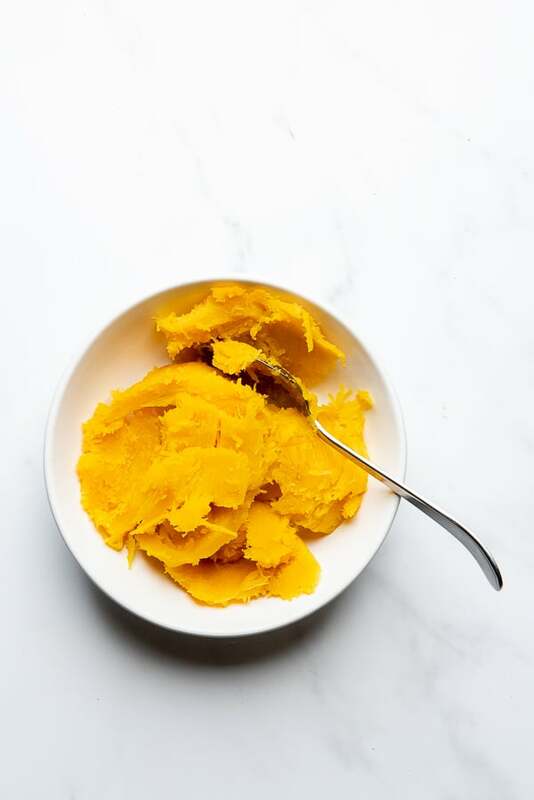 The method is simple and easy, as well as the puree freezes wonderfully for later use.The yield is highly dependent on the pumpkin's size and its meatiness. As a guide, I recently made puree using a seven inch diameter pumpkin whose flesh walls were about 3/4-inch thick which yielded 3 cups. Preheat the oven to 375 degrees. 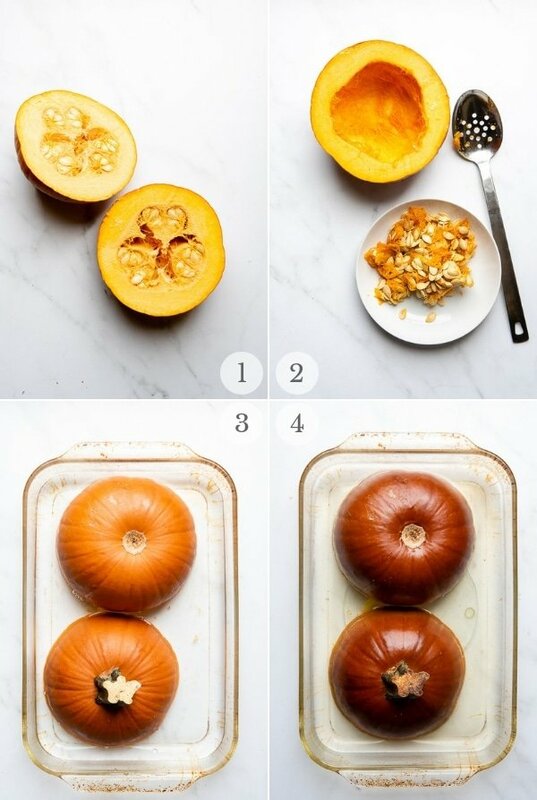 Cut pumpkin in half, scoop out all seeds and membrane. 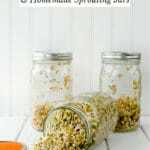 Save seeds for roasting! Place pumpkin halves cut side down in a large baking dish. Fill dish with 1 inch of water. Place into oven and bake for 45-90 minutes; until inside of pumpkin is soft (dependent on the pumpkin size and thickness). Remove from oven. Let cool to handle. Scoop out inside into a food processor or blender and pulse until pureed. I love it! Sounds so easy to make! It’s the perfect recipe for fall, definitely makes cooking easier if you have a homemade puree available! I think it’s awesome that you’re sharing this recipe! Love this DIY idea! I need to try this immediately! This looks much easier than I thought it would be. I definitely want to try making this! Love knowing exactly what is in the food I am eating. Too easy and homemade is always better! Great post- everyone needs to know how to do this!